Being outside is a big part of our family lifestyle. We love to explore new places but we also love to curl up at home and relax. So why should we stop enjoying the outdoors as soon as we come home from a day out, or when the sun goes down? 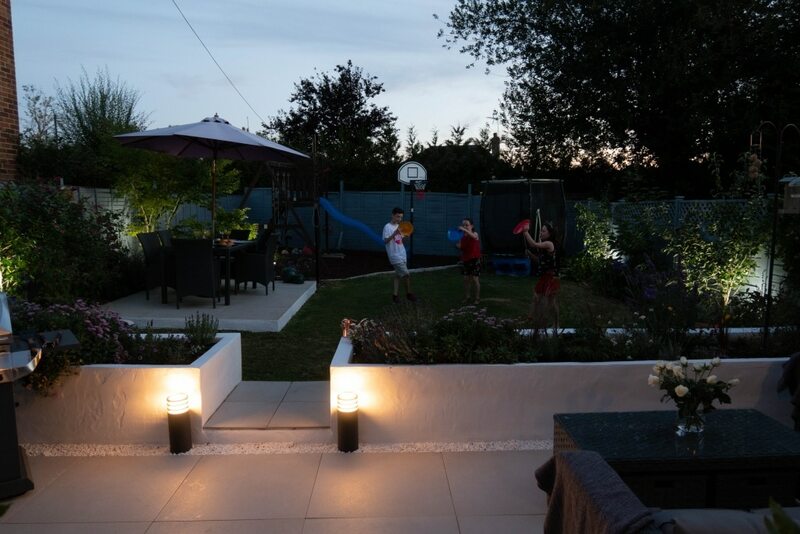 The garden has also been a major element of our home renovation, whereby we wanted to create an extension of the house, somewhere for the children to play and for us to relax. However we have been restricted by light – or the lack of it – in our case. With this firmly at the front of our minds we have been busy creating a new outdoor garden space including installing new garden lighting. 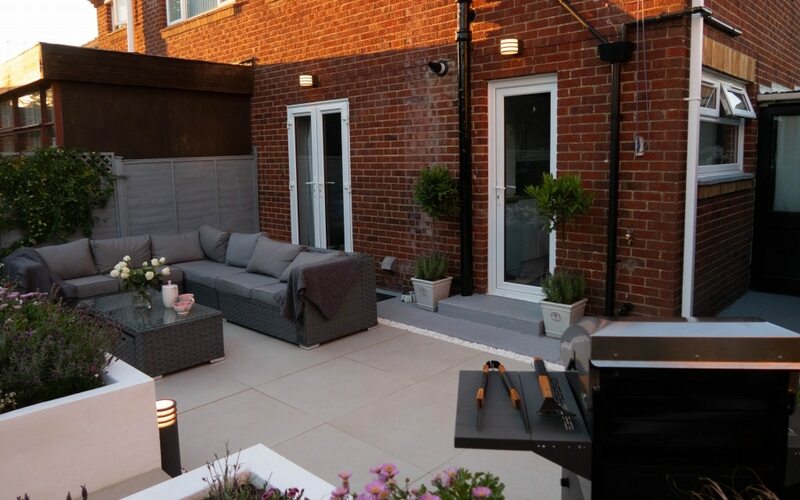 Now we can use our garden for longer than ever before, and not just during the longer sunny summer months, now we can also enjoy the garden when the nights start drawing in. 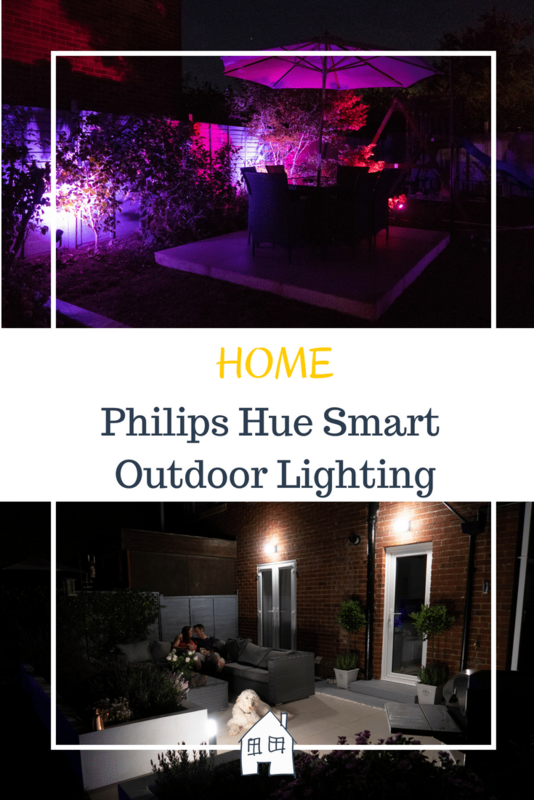 To accompany their indoor range of smart lighting, Philips Hue have now developed a new outdoor smart lighting range, Hue Outdoor, which is suitable for all of your outdoor spaces. We have picked some of the products from their range, which fit perfectly into our new outdoor garden space. What Lighting Have We Chosen? 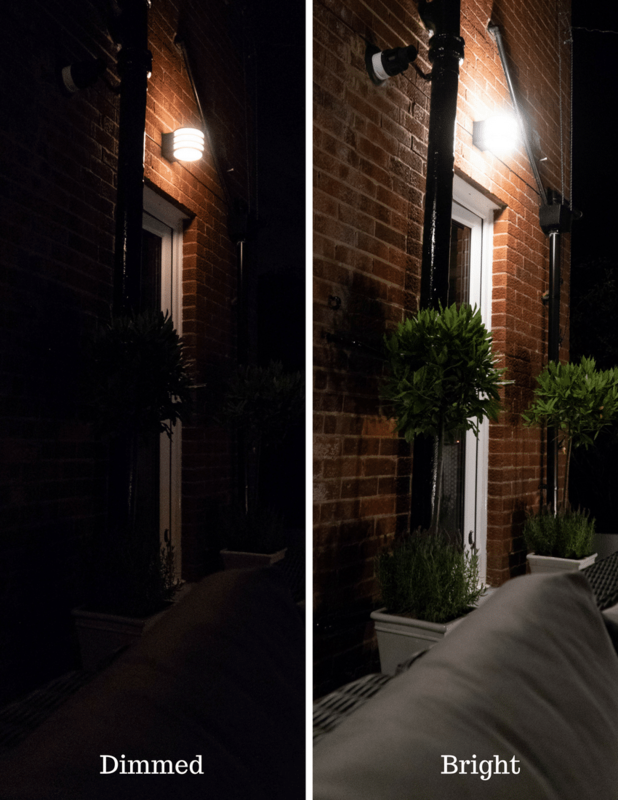 As you can see in the picture above, we have installed two of the Philips Hue Lucca Wall lights above each of the external doors on our house. This has provided not only enough light to illuminate the seating area, but they also light up the steps and door areas, so we don’t trip over in the dark. These have been installed directly onto a mains supply but as all the Philips Hue bulbs are WiFi controlled you can access these easily through various controls (via the Hue app, or your favourite voice assistant, such as Amazon Alexa, Google Home and Apple Siri). We have placed two Philips Lucca Pedestal Lights by the step on our patio leading the lawned area of our garden. This has provided us with a fantastic amount of light further down the patio and lights up the step perfectly. The electrician commented on how easy the lights were to install and each item came with installation instructions. Again these lights are wired into a mains supply. 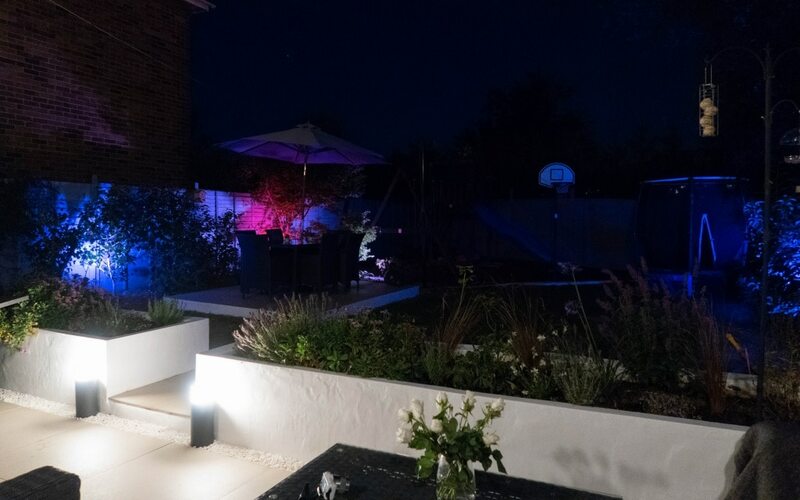 Being able to add spot lights into the garden area has instantly turned the garden into a really modern and inviting space. We have installed five Lily Spot lights into the flower beds on either side of the garden. These are very easy to install, so you can do this by yourself without the help of an electrician. 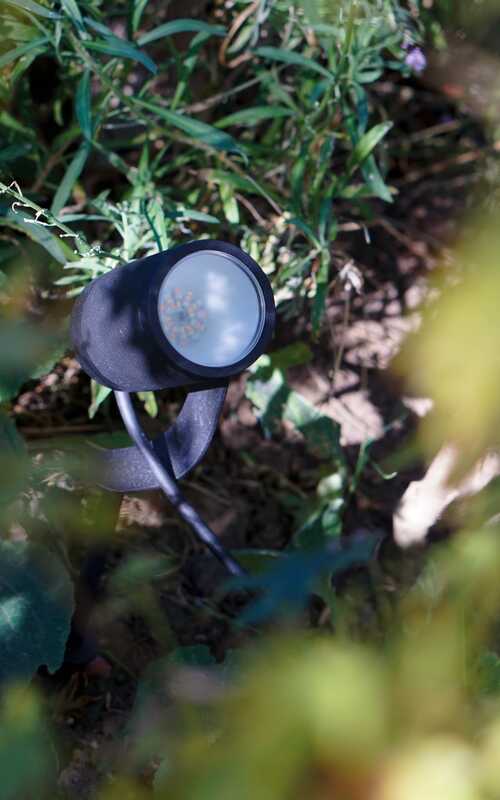 The Lily lights are plugged into a weatherproof outdoor socket and then placed anywhere in your garden. We have them placed discreetly in the flower beds to light up foliage and trees. 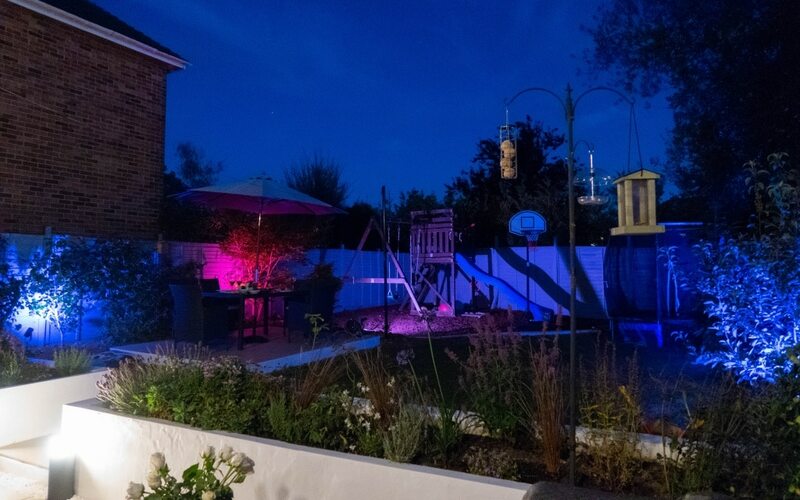 They’re even bright enough to light up areas in the garden like the play area meaning the kids can now play happily in the garden for longer in the evenings. The power supply is plugged into the socket along with a PSU pack which then runs off the lighting. You can have five lights connected to one power supply. 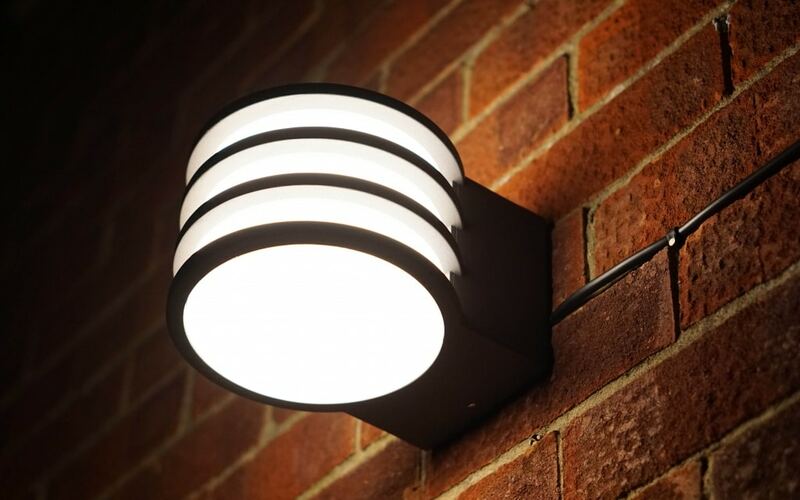 These lights are easily connected using the extension cables supplied and snap and screw connectors. You can either install them with a spike in the ground or a screw plate to attach to a surface, both of which come supplied with the spotlights. Smart products are becoming more and more popular in our homes and I am really enjoying being able to synchronize my home to work with us. Along with the Philips Hue Bridge you can control your lights in so many ways. 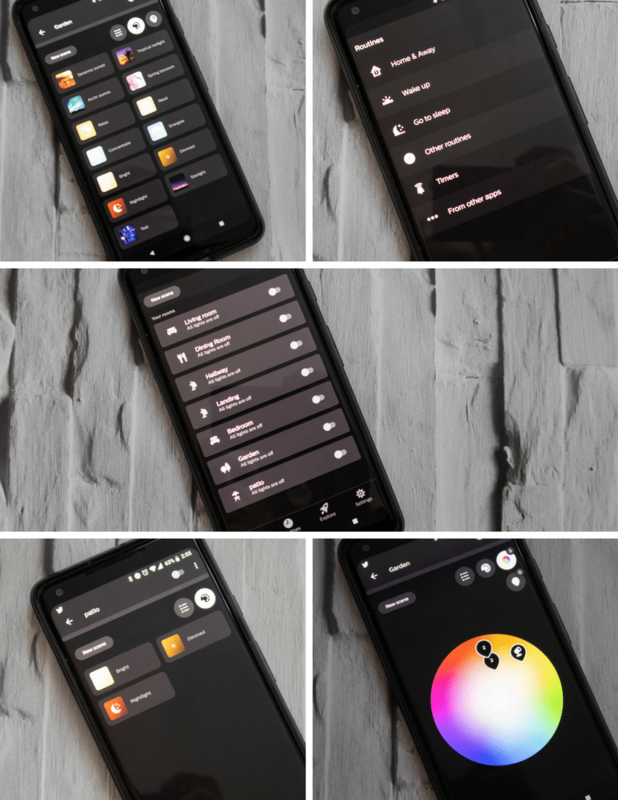 The app allows you to have so much control over all your lights from both home and away, allowing you to create timers and routines suited to your preferences. You can install switches on the walls if you prefer a more traditional way of controlling your lights. You can even use your favourite voice assistant to tell your lights to turn on or off! Or simply turn them off using your phone! This is where the fun part comes in! I love how flexible the Philips Hue lights are when it comes to lighting up your garden. As you can see from my pictures we have really enjoyed playing around to explore with an array of colours. The Philips Hue Lily Spotlights gives you 16 million colour variations to choose from, including pre-set themes with vibrant colour combinations already available. We don’t use the colour all the time and the Lily also allows us to choose from various shades of white light, which is great for when we want a calmer evening! 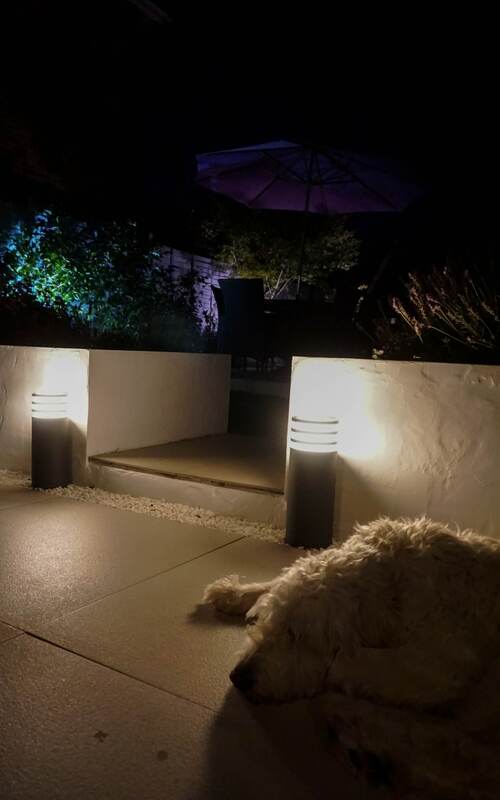 The Lucca wall and pedestal lights come in warm white, so whilst you might not get all the colour of the rainbow, you can still control the brightness of them from your phone, which is great for lazy evening, chilling out on the patio. Changing from dimmed to bright light, it really does make a difference on how much it lights up the space. Using the Philips Hue Labs on your smartphone you can set them to cycle through colours and have them changing by themselves. You can see from this picture how fantastic they look, and this is only a tiny snippet of what colours you can have. There are also great additional apps which work with the Philips Hue. The kids favourite one is Hue Disco. You’re able to set the lights to synchronize with your favourite music, creating a disco in the garden! One of the main security recommendations for keeping your home safe is lighting. 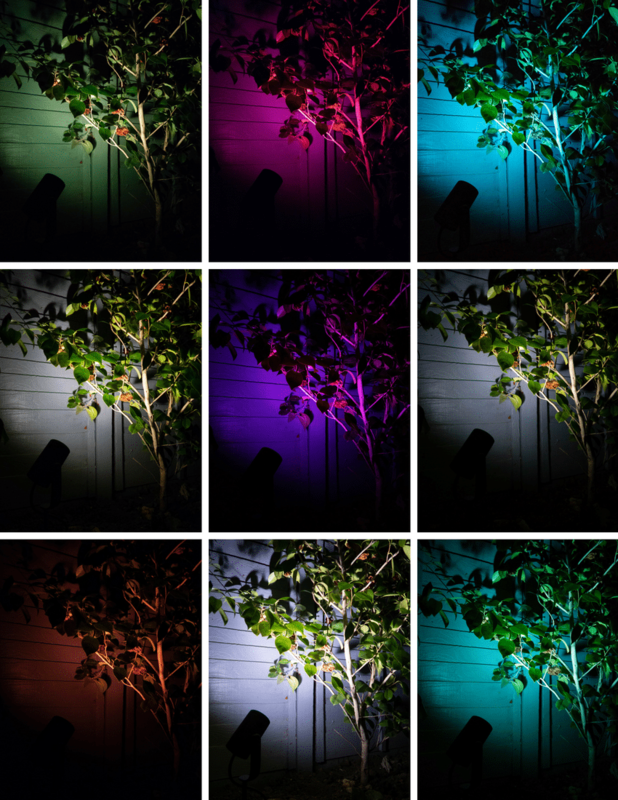 Lighting up spaces to make them safer is a great function of the Philips Hue Outdoor lighting range. 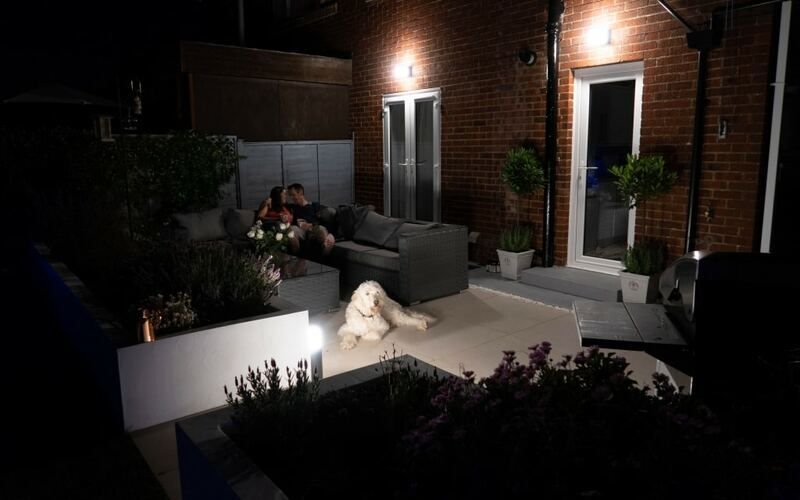 We have installed this lighting in our back garden but you can install this lighting in any of your outdoor spaces, including the front of your house. 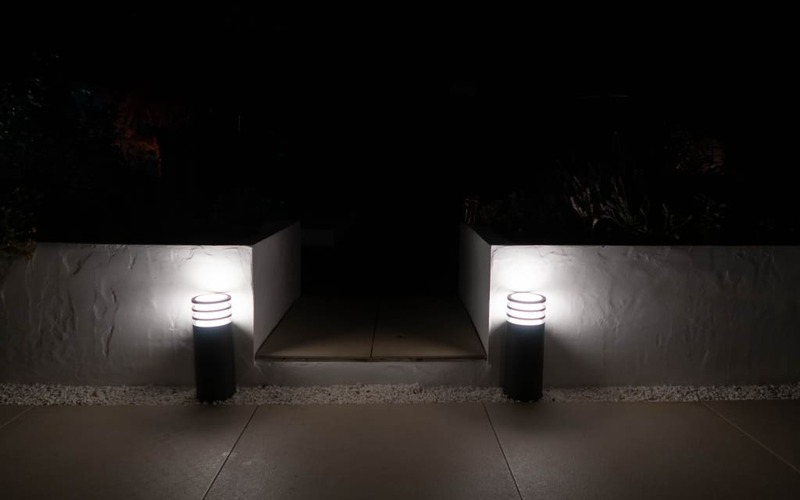 Lighting up path ways, door ways and any dark areas around your house. With the Philips Hue geofencing feature the lights will even detect when you’re approaching your home and automatically turn the lights on for you. So no struggling to find your keys in the dark or coming home to a dark house late at night. Also how many times do you forget to turn off the light? Well the feature also detects when your leave the house too and will turn them off for you. All of this is can be customised to people, times and what lights to control too. How Has The Outdoor Lights Changed Our Family Life? It sounds silly but it really has enhanced our lives. We have spent every evening sat outside together since the lights have been installed. The children have loved playing in the garden with the lights on. 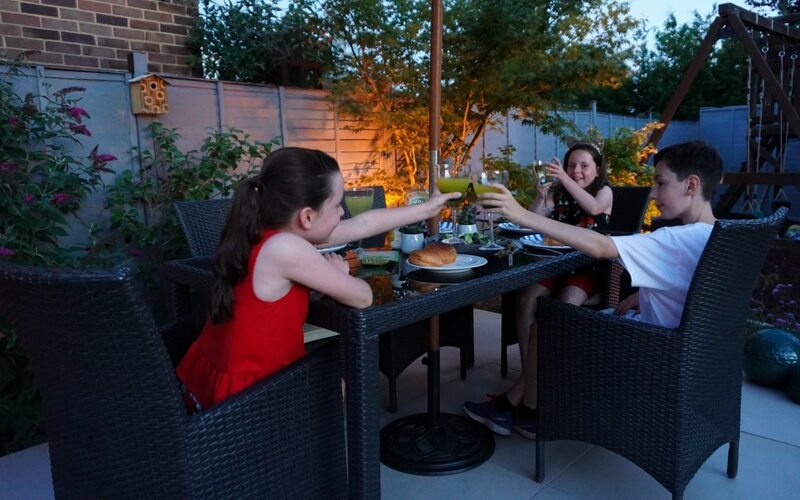 They make it much more exciting and as the evenings become darker but not necessarily colder they’re going to be able to enjoy our outdoor space so much more. Being able to play or even snuggle up on the sofa outside reading a book. We love to have BBQ’s so being able to sit and eat outside is great but not when you can’t see your dinner! So having the Lily Spot lights installed around an eating area gives us more than enough light. My husband and I have been able to sit outside snuggled up on the sofa until late. Before we would have gone to bed or watched TV, being with each other but not chatting as much. Being outside has taken us away from modern distractions and spent quality time together. Even the dog loves the new lights! He’s often found snuggling up in front of them! When it comes to lighting there is always an endless range of lighting to choose from and a huge difference in price. However the Philips Hue outdoor range is priced at a really reasonable price. To have so much control over your lighting is amazing and I think my garden has the WOW factor now! Head over to the UK Meet Hue blog to find out more information and inspiration. Oh the spot lights would be amazing in the garden with the oranges and reds for Halloween!! Thank you, glad you liked the post! Oh my goodness, what a massive difference!! My boys use Philips Hue lights as night lights and their fab. I didn’t know that they’d created an outdoor range. This is something I absolutely need to look in to as I’d love to light our garden during the autumn/winter months too. They are amazing aren’t they, they have made such a difference to the garden and how it looks. Those lights are lovely! We have (some) smart lighting indoors but I’ve never even considered it for outside before. You’ve definitely convinced me we need to add a bit more colour with our lights! Looks fab, and your garden is stunning! The garden looks amazing! I have some path lights in my front yard but they are cheaper ones. I can’t put lights in my backyard or the dogs would mess with them. Thank you, oh dear cheeky dogs! Nice lighting setup. Love your garden. And it’s awesome that you can control brightness through an app. Really awesome! Thank you very much, we are super pleased with it! 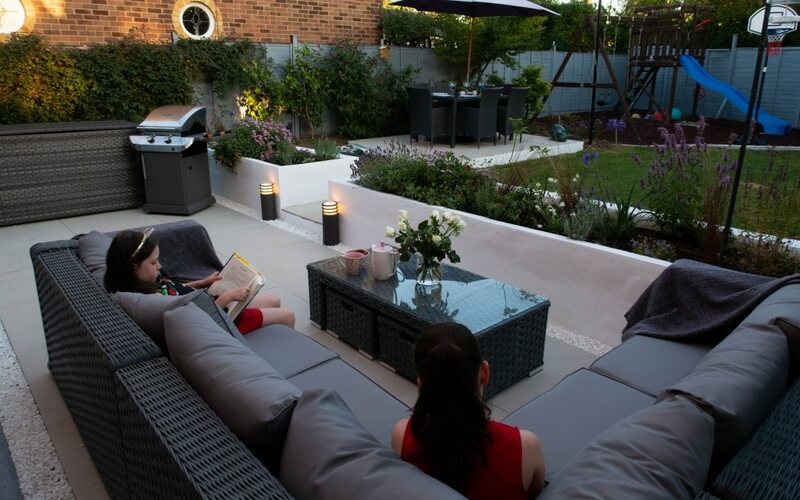 Your garden is beautiful – what a fantastic space to be able to enjoy with the family. I can really see how the Phillips lights have enhanced this too. I love the colour combinations and and disco function – I think my boys would love that too! We’re looking to re-do our garden at some point so will definitely keep these lights in mind. Wow your garden looks absolutely gorgeous. 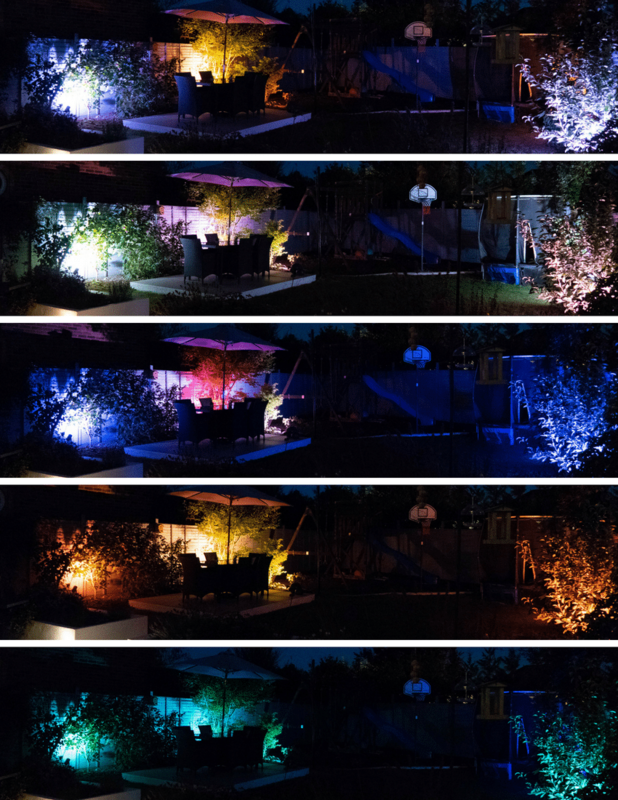 I love those hue colour spotlights, they really transform the garden. It looks so different when we don’t have them on! Your garden definitely has the WOW factor. It looks amazing. Love the lights and the sofa. Thank you, we love it so much. So many colours to choose from too, whatever your mood! These all look gorgeous! It’s amazing what good outdoor lighting can do! Gosh, this is brilliant! I could do with all this in our garden. So cool! Makes it a fun space to be doesn’t it! Wooow! You got the best outdoors I must agree. If I lived there, I’d actually stick to the outdoors. The lighting even makes it perfect and it’s nice to see that Philips Hue Smart Lighting can be operated with the phone. That’s what we call convenience,right? I much prefer to sit outside now rather than indoors, much nicer space now! They change the whole feel of the garden so we are super pleased with them. Oh wow your garden is stunning. I love the lights and the fact hat you can colour change and control them with a phone! Your garden looks amazing. Technology has upgraded so much love that on n off concept of lights through Google. Yes there are so many ways to turn on the lights now! However we have a simply on off switch too for them!! Oh I will look at this company. We are planning on de doing our garden before christmas and as my hubby is an electrician, he loves outdoor lighting! I really like the Pedestal Lights, perfect for our small garden. Wow. That’s pretty neat and innovative. Especially loved the lily lights. And they consume less power too. So great overall! I’ve been reading a lot about these, I love the concept of them. Definitely need more outdoor lighting at my house as well, so I might have to get these! What a fantastic idea! I absolutely love the colour changing element. Brilliant idea aren’t they, it’s fun choosing which colour to have my lights! We were just talking about garden lights. Will check these out. The lighting has made such a difference, it looks strange without them on now! I definitely think that you accomplished your garden renovation goal by installing the Philips Hue Outdoor Smart Lighting. 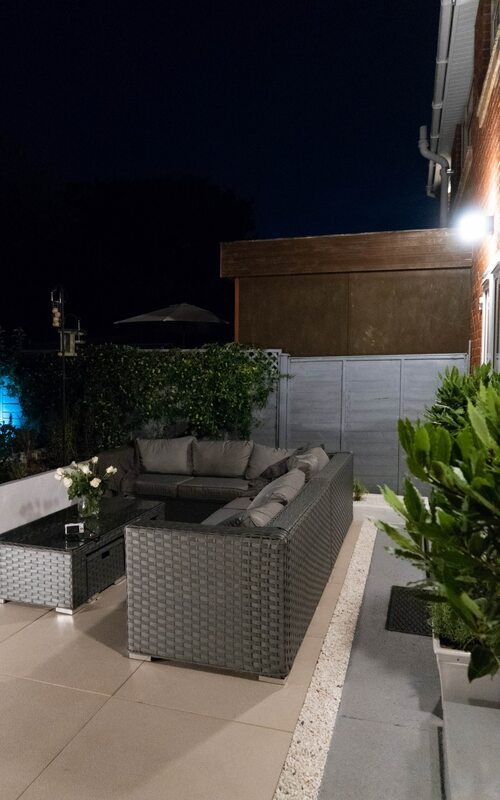 From looking at the pictures the wall lights really improve the seating area and the color lights give your backyard that WOW effect. Great job! What a fantastic idea – we need some lighting at the front of our house – particularly as the evenings start to draw in again. These would be good, you could get them to turn on when you approach the house! Wow they’re incredible lights and have really finished your garden off. I love the colour changing feature and how you can control via multiple ways. They really are fab outdoor lights! You can do so much with them and so many colours to pick! What a stunning post and truly amazing effects from the lighting! Your garden looks wonderful. I’m with you about extending the amount of time we can spend in our gardens. We renovated our garden this year and hubby installed a huge fire pit, I am really looking forward to using it during the cooler evenings . Wow Steph, your garden and the lights look incredible. I have some indoor Philips Hue lighting which we love but this looks incredible in your garden and my mind is now buzzing with how I can incorporate this outside for next summer. 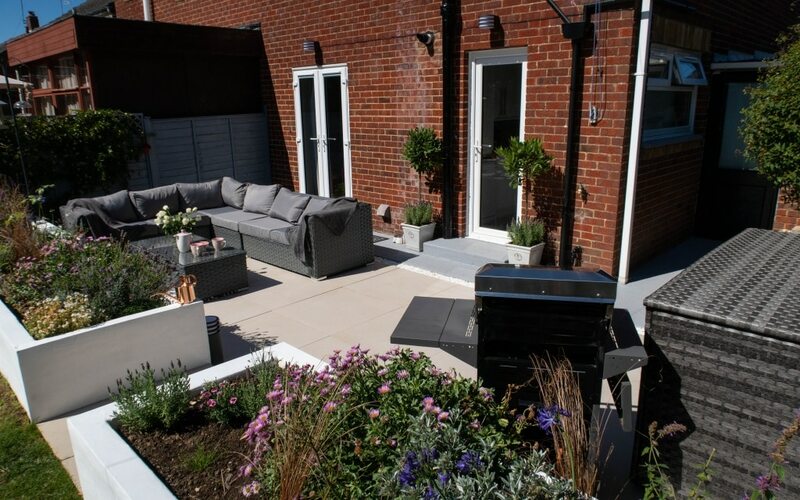 Fabulous video too, such a thorough run down of your outside space and the products! Oh Steph. It looks amazing. You must be so pleased. Whenever I see amazing gardens they almost always have proper lighting. I think it’s often the lighting that takes an outdoor space from ordinary to extraordinary. This will definitely mean you’ll get more use of your garden right through the winter months, when it’s dry of course. I like the look of those lily lights and they do t look like they would be too hard to install on our decking if we only need an outdoor socket. I’m definitely going to look into this for next summer. Ah thank you Stacey! I am over the moon with it. Lighting really does change the space into something special. We’ve had friends over in the evening and sat outside using the space until late, which we never would have done before. 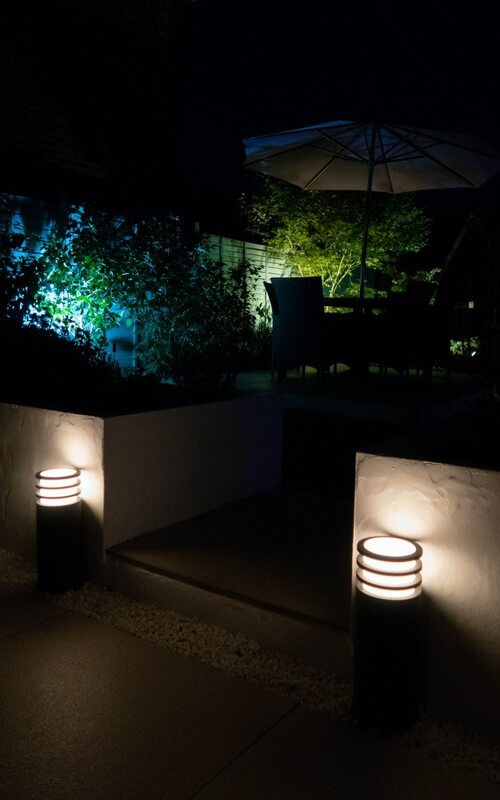 The Lily spot lights are super easy, just a case of spiking into the ground or screwed into the wall, like you said as long as you have a outside socket they are plug and go! Thank You so much Kimberly. I am so happy with it, it’s such a nice place to be out in now and I want to spend all my time out there!! 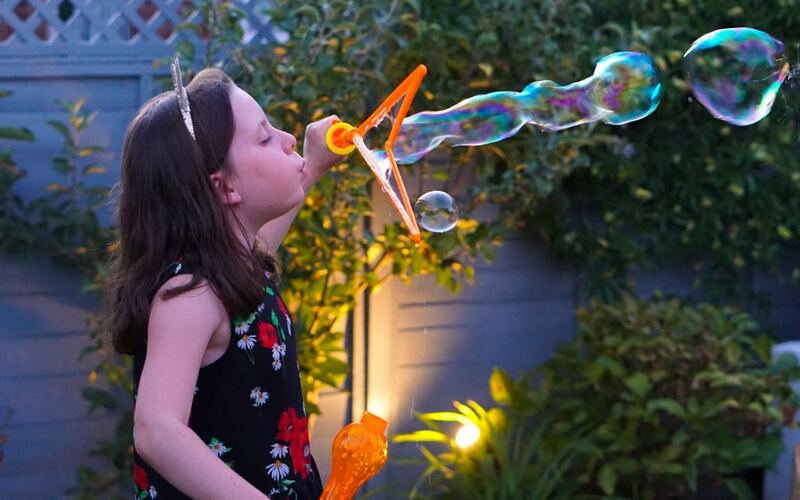 I loved that photo too, they LOVED those bubbles!